Jane Daniels is fundraising to help pay for revolutionary treatment for her brave mum, Caroline who is fighting terminal cancer. The daughter of a brave Burnley woman, who has been given just 12 months to live after being diagnosed with terminal cancer, is holding a fundraising event to help pay for revolutionary treatment. Jane Daniels is hoping to raise around £70,000 to pay for immunology therapy for her mum, Caroline, who was given the devastating news that she has just 12 months to live after the cancer she has been battling for three years has now spread to her brain. Caroline Daniel's bravery and positive attitude has inspired family and friends who are fundraising for treatment for her in Germany . Jane (24) said: "There are no words to describe the heartbreak me and my family are feeling at the moment. "My mum has spent the last three years fighting the hardest battle there is and she has been incredibly brave and strong and she always manages to smile. "She is by far the most positive woman I know and every time she is knocked down to her lowest she gets back up." Ten years ago Jane lost her dad, Nick Daniels, to cancer. She was just 13 at the time and her sister, Lisa, was only 11. Caroline and Nick had been together for many years and although they never married, Caroline took his surname after his death. Nick worked for British Gas but was well known in the town as he played guitar with a U2 tribute band Rattle and Hum. Jane said: "To lose a parent so young was devastating and not something you ever get over, you just learn to live with it as best you can and help each other through." To help give her mum a fighting chance Jane decided to start fundraising for the immunology treatment that is only available privately at a variety of clinics in Germany. The therapy, which is not available in the UK on the NHS, is a type of cancer treatment that boosts the body's natural defences to fight cancer. It uses substances made by the body or in a laboratory to improve or restore immune system function. Jane, who works for Burnley based charity CAPLL as a venue administrator, added: "I couldn't rest if I didn't believe I had done all I could for my mum. "We are so close, she is my best friend, we do everything together and it breaks my heart that I may not have my mum with me anymore. "After losing my dad you ask all kinds of questions such as who will walk me down the aisle and who will be there when I give birth?" Jane is inspired by her mum's fighting spirit and also the positivity of the medical team who have not given up on Caroline as she will still be receiving treatment. Jane is hosting the fundraiser at Burnley Miners Club on Friday, October 12th, with her partner Vinny Licastri, her sister, Lisa (21) and their aunts, Debbie Toms, Lynne Uren and Tina McGinley. There will be entertainment, a grand raffle, auction, fun games and a pie and pea supper. Jane also hopes to use the event to raise awareness of ovarian cancer which 52-year-old Caroline, who attended the former St Hilda's RC High School in Burnley, was first a diagnosed with three years ago. Known as the "silent killer" Caroline went to her GP with symptoms of bloating which never eased. When it was discovered she had cancer she underwent a hysterectomy and endured several rounds of chemotherapy. She went into a remission but then started suffering daily episodes of sickness, dizziness and fatigue which doctors at first thought was vertigo. But when the symptoms got worse, Jane took her mum to A and E and scans revealed Caroline had a brain tumour. Jane said: "They were surprised as it is rare for ovarian cancer to spread to the brain.."
Surgeons successfully removed all of the tumour but complications arose when fluid starting leaking from the wound and Caroline was rushed back into surgery to repair it. Caroline, who lives in Harle Syke, then faced further rounds of chemo and radiotherapy and doctors started her on the drug Niraparib to give her a longer remission but the side effects made her extremely ill.
And when Caroline found a lump on her neck tests revealed that the cancer had spread aggressively through her lymph nodes. 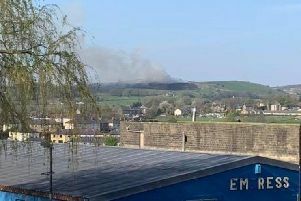 Jane, who lives in Barrowford, said: "My mum took the news calmly like she always does and she is ready to battle on again. "Her positivity is amazing and rather than wallowing in pity and asking why this has happened to us, we want to spend every moment being the family we are." Raffle tickets are also available, at £1 a strip, from Jane via her facebook page.